Grapevines are rewarding plants to grow, giving you home-grown grapes for snacking, making preserves and even wine-making. These plants require a lot of care and maintenance, however, especially when it comes to pruning and training them. There are many different varieties of grapevines, some considered “hardy” and better suited for colder climates, and some that are “tender” and grown mostly in climates with mild winters. Further, some grape varieties are grown mainly for wine-making and others for their flavor suited for jellies, juices and fresh eating. Water grapevine deeply to soak the soil down to and around the roots once each week throughout the spring and summer, whenever rainfall is less than ½-inch per week. Water your grapevine two or three times each week during prolonged dry, hot conditions or droughts. Feed grapevine in the spring of the second year, when the buds begin to swell, with a 10-10-10 NPK (Nitrogen-Phosphorous-Potassium) fertilizer. Apply ¼ lb. or less of the fertilizer, spreading it in a circle around the base of the grape vine, but about 3 or 4 feet away from the central trunk. Feed grapevine in the third year and thereafter with 1 lb. of 10-10-10 NPK fertilizer, spreading it in a circle on the ground around the base of the vine. Fertilize grapevine once each year in early spring after bud-break, keeping the fertilizer about 6 to 8 feet away from the base of the vine. Remove weeds from around grapevine either by hand or by hoeing shallowly. Or spread a 4- to 6-inch-thick layer of mulch around the grapevine to control weeds and retain soil moisture. Insert at least two strong posts that are about 6 feet tall. Stretch two wires horizontally between the posts, ensuring that the bottom wire is about 3 feet up from the ground and the top wire is about 2 feet above the bottom one. Prune and train grapevine in late winter or early spring, while the vine is still dormant and before new growth appears. 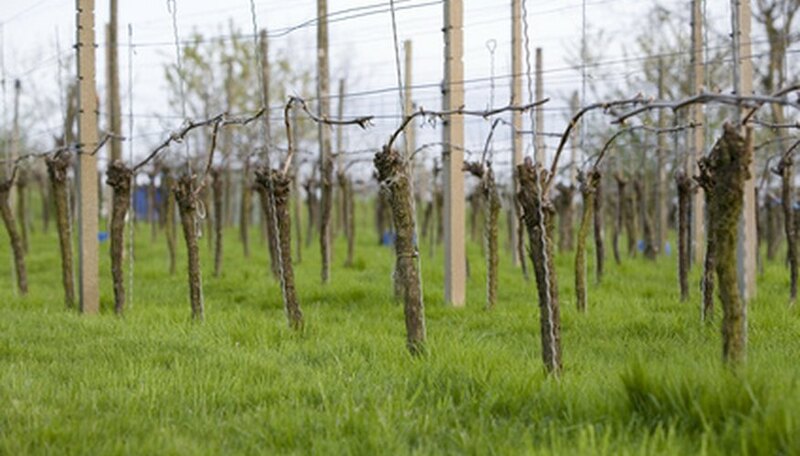 When the vine grows to the first wire, prune away all shoots growing between the wires and trim back all shoots growing along the bottom wire to only two healthy buds. Remove all suckers or vertical growth that emerges from the base of the grapevine to develop a single strong cane. Tie the emerging side shoots to the wires during the second summer to train them to grow laterally. Remove all flower clusters that emerge to prevent the young vine from producing grapes too early. Train and prune your grapevine to remove all side shoots and preserve either two or four lateral branches, depending on the pruning system you prefer. 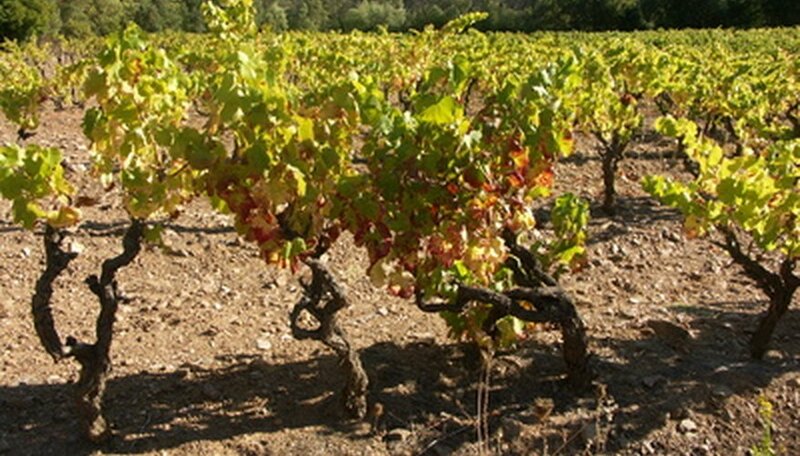 Grapevines produce fruit on the previous year’s growth and won’t produce fruit more than once on the same cane. You'll do more damage to your grapevine and fruit quality by under-pruning rather than over-pruning. Prune your grapevine thoroughly every year in late winter. Harvest grapes when they're totally ripe on the vine, because the grapes won't ripen off the vine. Remove the grape clusters using pruning shears or a sharp knife. Watch for common grapevine pests, such as aphids, Japanese beetles and mites. Also beware of fungal diseases that can attack your grapevines, especially if you live in a humid climate, such as downy mildew, black rot and anthracnose. Treat grapevine with an approved insecticide or fungicide when pests or diseases occur.